Saint Peter's heroic struggles recall the spiritual labors of Saint Anthony the Great and the monks of the Egyptian desert. This unseen and inner warfare is not confined to monks alone. From the moment of our baptism, all Orthodox Christians are called to fight the varied lusts and passions of the flesh and to oppose the evil demons who ceaselessly rage against us day and night. As the Apostle Paul says, For we wrestle not against flesh and blood but against principalities, against powers, against the rulers of the darkness of this world, against spiritual wickedness in high places (Eph. 6:12). 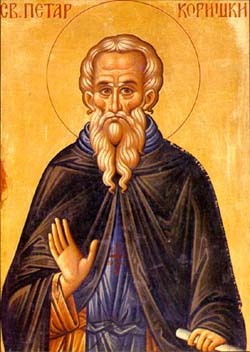 Saint Peter of Korisha was born in the late twelfth or early thirteenth century in the village of Unyemir (present day Uymir) near the Serbian city of Pech. 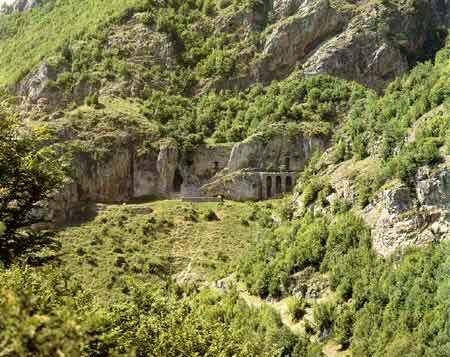 It was the time of the full flowering of the medieval Serbian state in Kosovo. His parents were pious and honest Orthodox Christians who had their children baptised and taught the holy Orthodox faith. From childhood, his humility and purity showed that God's grace was already forming this young soul for great things. He avoided the games of other boys in the village and any useless and spiritually unprofitable social gathering and occupation. This greatly saddened his parents, who, not understanding his desire for the things of God, wanted him to play and have fun with the other children. The young boy showed a spiritual maturity beyond his years and took fervent pains in fasting, prayer, visiting the parish church and in studying the Bible and the sacred Tradition of the Orthodox Church. From reading the Bible, he understood that in his desire to serve God he needed to leave everything in the world, even his home and his parents. In his soul he yearned to dedicate himself to serving God in silence and solitude. After the death of his father, Peter decided that the time was ripe to leave home and begin a new life in some hidden place. But his mother implored him not to leave her and his younger sister poor and alone in the world with no one to care for them. Moved with pity by his mother's plea, he stayed and took charge of providing for the household. Even with these added responsibilities he did not reduce his podvigs (spirituals struggles) of fasting and prayer, but rather doubled them. Unbeknown to anyone except his mother, he wore a rough hairshirt under his clothes. As a loving parent, she could not fail to notice her son's ascetical struggles and the effects they were having on his body. She was afraid to voice her concern for fear that he would leave them for some desert place. After his mother died, Peter decided to fulfill his long-held and God-pleasing desire to leave the world. He spoke with his young sister Helena and asked if she would get married. The young man's conscience would not allow him to leave her alone and unprovided for. Helena, however, also had a love for virginity and purity, and did not desire to be separated from her brother. She implored him to allow her to accompany him, promising to take part in his life of prayer and fasting. Peter calmly told her, "Let God's will be done." Together they left the village and in the nearby church of the Holy Apostles Peter and Paul he received the monastic tonsure from an old monk who lived close by. Here Peter built separate cells for himself and his sister and they lived in asceticism with fasting and prayer. Peter quickly showed great spiritual strength, perseverance and victory in the hard struggle with demonic temptations, a struggle that was to characterize the rest of his life. Inspired by the reading of the lives of the saints and the great Fathers of the Church, Peter wanted to undertake even greater struggles of prayer, solitude and silence, but felt held back because of his sister. In his desire to serve God, he finally made the difficult decision to secretly leave her. Yet when he attempted to do this, Helena noticed and followed him. Travelling together, they came to the high mountains overlooking the town of Prizren, close to a village called Korisha (present day Kabash). They were both tired after the long journey and stopped to rest. In her exhaustion, Helena fell into a deep sleep. While she slept, Peter prayed and decided to leave her, to go far away by himself and hide from the world among the mountain caves and rocks. With heartfelt prayer and tears, he committed the care and protection of his sister to God. He asked for himself the grace of beginning of repentance, that he might serve God faithfully and receive salvation. Making the sign of the Cross over his sleeping sister, he went quietly away, crying because he had to leave her. When Helena awoke and did not see her brother, she called for him and, receiving no answer, she realized that she was left alone. She cried bitterly, "Holy Mountain of God. I beg that I find death in you. Although you have graciously received me, I am alone. Have mercy upon me. Accept me here and keep me until I die. I do not want to return and live in the world. Neither am I worthy to live and see my brother." Weeping and sobbing, she set off for the village of Korisha. Here she lived secretly in virginity and holiness, just as her brother had taught her, pleasing God until she died. When Peter heard the news about Helena's holy repose, he thanked God from his heart, for he had never stopped praying for her. On leaving his sister, Peter climbed high into the mountains and found a cave in a cliff. Here he lived for the rest of his long life in that complete solitude that he had for so long desired, hidden from the sight of men. In freezing winter cold and burning summer heat, he continued his spiritual struggles as if he were an angel, living on wild plants and acorns. He had no mercy on his body because he wanted to cleanse himself of his passions and give himself as a pure offering to God. Wild animals never troubled him but lived with him in peace. For many years demons continuously warred against him, particularly through the appearance of a snake, whose attacks brought him no rest. During the night the rocks would resound with the shrill cries of the demons. They called him with a voice like that of his sister, begging him to save her from wild animals and to accept her into his cave. But the saint knew of their demonic cunning and trickery. Ignoring them, he ceaselessly sang psalms and spiritual songs until sunrise. When at last he grew weary of the constant presence of the snake, he began to pray fervently, fasting for forty days and calling for the help of an angel of God. He left his cave and began to fight the demonic snake with the Name of Jesus. Suddenly an angel full of light appeared and Peter, by now an old man, stepped back in awe. Taking him by the hand, the angel said, "Do not be afraid. I am Michael, archangel of the Lord's army. Because of your prayer, God has sent me to punish the cunning snake that is harming you Now you shall see the glory of our God." With these words, the holy Archangel took his sword and attacked the snake, driving it away. The Archangel Michael continued, "Peace be with you, soul who searches for God. You have just seen the glory of our God. Your cry to God has been answered through me, and the wicked and cunning serpent will never trouble you again. Take care of yourself and grow in the strength and power of the Lord. In the future, you will suffer many attacks from jealous and envious evil spirits, but fight them back with the name of the Lord and they will run away in shame." With these encouraging words, the Archangel vanished. Peter was filled with awe and great peace of heart and he beat his breast in humility. "I am black with passions, and give off a vile stench because of my sins. Who am I, Lord, that Thou shouldest send me Thine most glorious and splendid Archangel?" He reentered his cave with tears, giving thanks to God and the holy Archangel Michael. After this, Peter undertook even harder podvigs. He acquired such purity of mind that he could see all demonic traps, breaking them by prayer and vigils. The devil particularly tried to push him out of the cave away from the place of his struggles. One day, the evil one attacked him in the form of a great cloud of black ravens who wanted to gouge out his eyes. The holy hermit fought them by prayers and the reading of the Symbol of Faith (Nicene Creed) and they fled. The devil brought before him many other unclean and demonic visions, but Saint Peter fought all these temptations and torture, knowing that God saw his struggles and would reward him for his endurance. Desiring still closer union with God, the saint undertook even great ascetic struggles that infuriated the demons. Using the sharp rocks of the cave to wound his body, they were powerless in their attempts to divert his steadfastness of purpose. They told him that the cave was their home, and tried to frighten him with visions of wild animals and other demonic fantasies. Peter answered all their cunning traps with heartfelt prayer to God. He told the demons, "Even if you send many more of your demonic legions, my heart will not be afraid. If you attack me I will show courage against you in the Name of my Lord." He prayed to God, "Lord, help me. Have mercy on me for I am weak and my sinful soul is very disturbed." And God in His mercy always strengthened him. The demons then tried to tempt him with thoughts of pride and vainglory,but Peter fenced himself around with humility, saying, "I, who am but dust and ashes (cf. Gen. 18:27) before my Lord, cannot do anything by myself. That is why I am fasting and suffering here in the desert, because He is my God, my Saviour and my Protector. In Him I place all my hope." After this great victory over all demonic temptations, the Lord gave him new strength and filled him day and night with the unspeakable joy of divine light. This vision lasted for many days so that Peter forgot about his meager diet of bitter food and instead he fed on the heavenly sweetness from that divine light. Inflamed with love for his Lord and Saviour, he repeated the words of the Holy Prophet, King David, the psalmist, My soul thirst for God, for the living God. When shall I come and behold the face of God? (Ps. 41:2). Peter continued the rest of his years in superhuman asceticism, growing in angelic virtues, always spiritually happy and thankful to God. Devils now never dared to approach, being afraid of the grace that God granted to this holy hermit. Peter was not proud of this. Building his salvation with godly fear, he always remembered the words of the Apostle Paul, Christ Jesus came into the world to save sinners, of whom I am chief (I Tim. 1:15). To the end of his days he judged himself and continued in the life of hesychia. The Lord did not want this spiritual beacon to stand unnoticed by the world, so He sent him some God-loving monks. When they arrived, they begged him to accept them and teach them the ascetic life. As he knew his death was close, he gladly agreed and blessed them to live in the cliffs below his cave. He asked them to cut him a grave in the rock inside his cave where his body was to be buried after his death. In response to their request, the holy elder told the story of his life and spiritual struggles. Soon, because of human weakness, the Saint fell ill. As he partook for the last time of the Divine and Life-giving Mysteries of Christ, he exclaimed, "Glory to God for all things." He continued in fervent prayer, saying, "Lord Jesus Christ, Son of God, accept my soul in peace. Give me grace and strength so that, as my soul rises through the air with the help and defense of Thy holy angels, it may pass undisturbed and without danger through the obstructions of the mischievous demons. May I be led by Thy holy angels to the place where I will bow down before Thee, my God. In Thy great mercy, may I receive Thy reward without judgment for my evil deeds." The servant of God then gave a last kiss of peace to the brothers, calmly giving his soul into the hands of the Lord, Whom he had loved from childhood and valiantly served in asceticism to his old age. He reposed on June 5, 1270 (or 1275). On the night of his repose, the brothers saw the light of many candles illuminating his cave and heard the sound of angelic singing. They found his body the next morning, wrapped in a hairshirt, resting in the stony grave. His face was shining with light and the cave was filled with a fragrant perfume. Soon the Lord glorified his holy relics and enriched them with wonder-working power and a sweet fragrance. That is why many believers come to these relics, and by faith they receive healings and consolation. 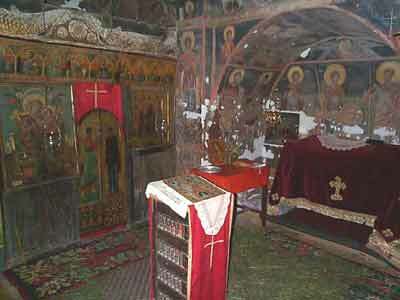 In the mid-fourteenth century, King Dushan of Serbia built a church over Saint Peter's wonder-working relics, and for a time the church was a dependency of the Monastery of Hilandar on Mount Athos. Part of the Saint's relics were taken to Constantinople and other places. At the end of the sixteenth century, the holy relics were in danger from the occupying Muslim Turks. The monks of Korisha took and hid them in the cave church of Saint Michael at Black River Monastery, 200 kilometers away, where they are preserved to this very day. Orthodox pilgrims from all over the world come to pray to Saint Peter. They receive bodily and spiritual healing through his prayers and fragrant, miracle-working relics. By the prayers of our blessed Father Peter of Korisha, may the Lord have mercy upon us and save us, because He loves mankind.